The BLM has prepared numerous plans over the years to “zero out” the West Douglas herd, claiming that its removal is necessary “to establish, maintain and preserve a thriving ecological balance” in accordance with the 1971 law directing the agency to manage America’s wild horses. A photo from the Cloud Foundation’s Facebook page shows a helicopter and a Judas horse (right) set to lead West Douglas mustangs into a trap. Taken by: Krisztina Gayler. As the U.S. Bureau of Land Management sees it, last month’s removal of 167 wild horses from a rugged, remote area in Rio Blanco County was a success, easing the strain on damaged range lands and substantially reducing a herd that had become too large to be sustainable. Wild-horse advocates tend to see the roundup in starker terms. 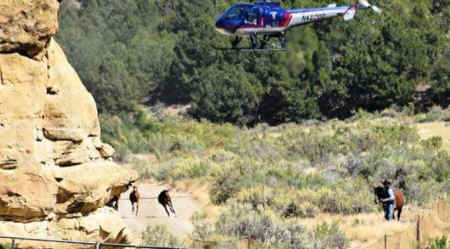 Two fatalities in the course of what BLM officials prefer to call a “gather” demonstrated the cruelty of using panic-inducing helicopters in the roundups, they say, and the capture of so many horses from the West Douglas Herd Area — who have since been transported to Canon City, to be part of the state prison system’s mustang-training program for inmates — has effectively eradicated one of the few remaining Colorado wild-horse herds. The roundup, which took place south of Rangely over the course of a week, came after federal courts rejected a series of legal challenges by The Cloud Foundation and other groups. The BLM contractor employed to remove the horses, Utah-based Sun J Livestock, has drawn complaints over the use of electric prods, buzzing helicopters too close to exhausted horses and other alleged abuses, prompting numerous observers from animal rights groups to follow the latest procedure closely. One member of the West Douglas herd died as it was being moved into a trailer for transport, after being trampled by another horse and getting [his] neck broken. But many observers were more outraged by the other death — a foal that Kathrens says was chased for an hour before it was roped. A report prepared by the BLM claims that a Sun J employee “successfully and gently roped the colt” — but the animal then bolted and fractured [his] right front leg. Yet video taken by observers indicates that the colt was already injured before [he] was roped, and a BLM spokesman confirms that version of events. The colt was subsequently euthanized. But critics of those plans have vigorously disputed the BLM’s assertions about overpopulation, starving horses and environmental damage, while lawmakers have questioned the cost of removal.